Whiskey drinkers today are interested in lots of things – good whiskey, of course, but also good stories. And also the truth. Finding good whiskey is actually pretty easy, despite certain labels being practically impossible to procure. Finding good stories? That’s easy too – historical figures, prohibition-era recipes, tales of lost this and discovered that, promises of the most locally-sourced ingredients – the stories take many forms. What seems to be in somewhat short supply though is the truth. A lot of this comes from the fact that there are so many labels that don’t actually distill anything trying to make you think they do. Go google what’s been going on with Templeton Rye, for instance, and you’ll see that a story that was once a good one (small town! Al Capone! secret recipe!) has been found to be lacking in the truth (mistruths! manipulation! confusion!). And a whiskey that was once thought to be a good one is increasingly being dismissed as a fraud (and a flavored fraud at that). I wish we lived in a world where people didn’t have to make up stories to sell something, a world in which they could rely on a good product and the truth. And maybe we do live in that world, or at least one that’s moving in that direction – since as people get more into whiskey and start to learn about who’s making it and how and why, they get a greater appreciation for the authentic. And thanks to social media and whiskey blogs and our never-ending access to looking things up, those whiskey hawkers that blatantly make up stories are increasingly caught in the act (thank you, internet). At Templeton, the truth seems to have caught up with the folks who have been spinning tales. They’re being sued, whiskey geeks are trouncing the brand, and I would bet that their sales are taking at least a small hit because of it. Which brings me to a few bottles of new-ish whiskey that have been sitting on my desk for a few months now. 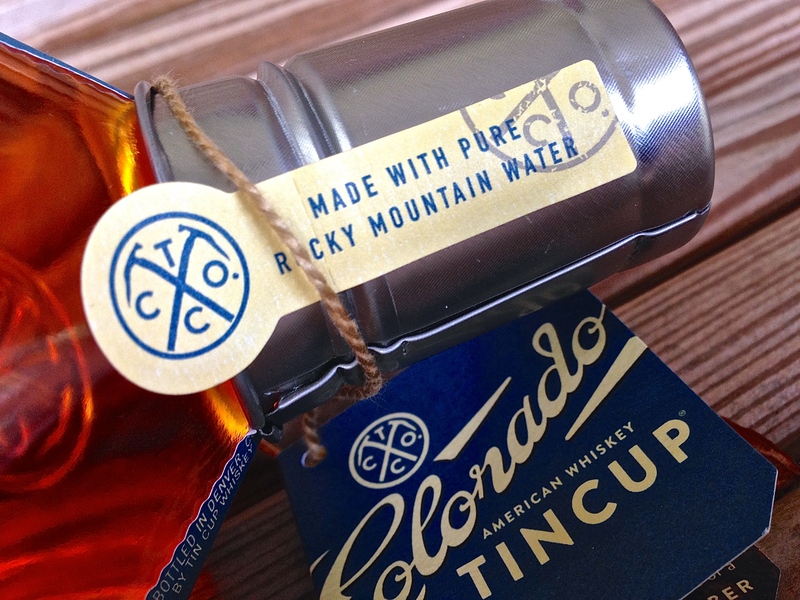 One is an “Alabama style” whiskey, called Clyde May’s, and the other is an “American” whiskey, called Tin Cup, bottled in Denver and made with pure Rocky Mountain water. They both have stories to tell, that’s for sure. They’re both decent whiskeys, at least I think so. And they both walk the the line where insinuation and deception intermingle. Let me be clear, I don’t think either of them are telling falsehoods – but they both play with the truth in their own ways in an attempt to tell a compelling story. On the Tin Cup website, you get more. It says, “Hello, I’m Jess Graber. I make whiskey… I began distilling in 1972… distilling became my full time work… (and) Tin Cup is my newest whiskey.” It goes on to say, “Let me explain how whiskey gets made here.” Let me repeat that… “whiskey“… “gets made“… “here.” Clearly they want you to know that Jess Graber is distilling this whiskey himself, right there in the gorgeous mountains of Colorado, right? Of course, they do. But he doesn’t, and they don’t. 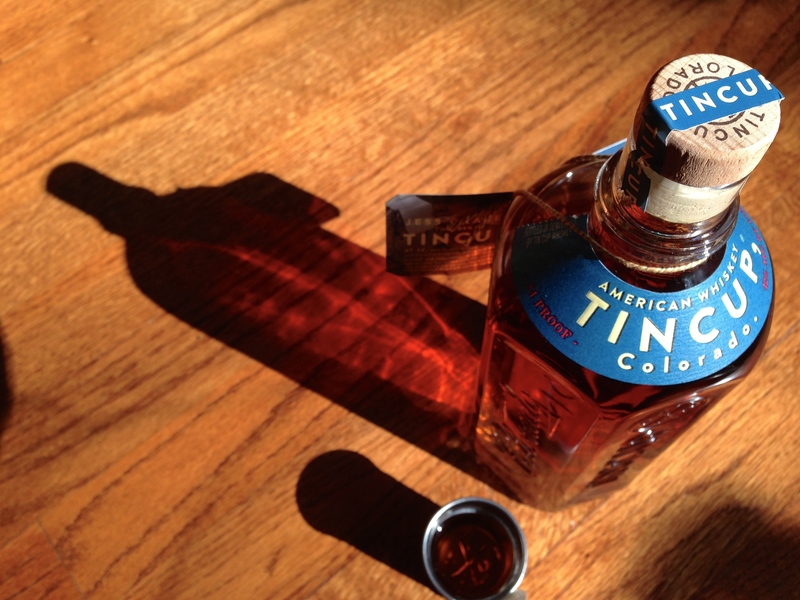 There’s a “what’s in Tin Cup” section on the site that never says a thing to lead you to believe the whiskey is distilled anywhere other than Colorado. 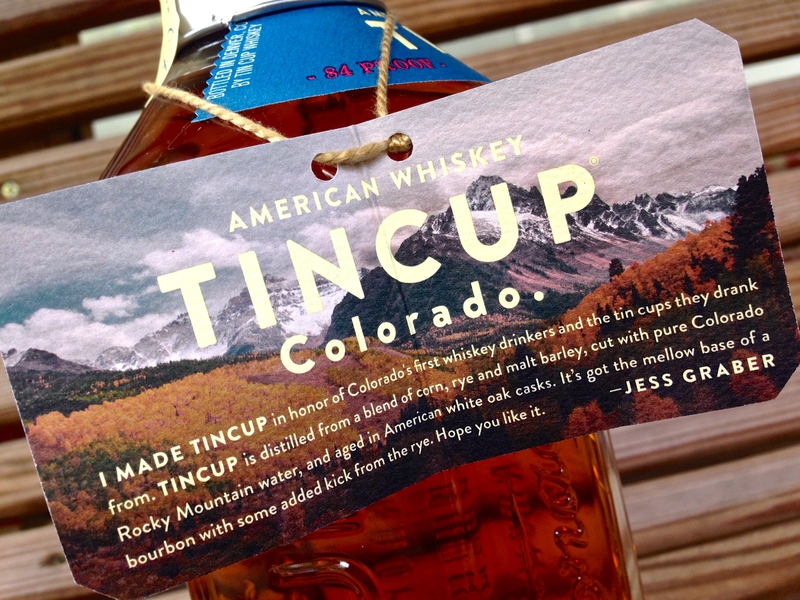 There’s a “Can I visit the distillery” section that does the same – leading one to believe that even though you can’t visit their distillery, there IS a distillery churning out Tin Cup whiskey somewhere in Denver. After all, Jess Graber helped found Stranahan’s, which DOES actually distill there. Now, I must say that while the bottle and the website are clearly trying to pull the wool over your eyes and have you believe that this is whiskey fully distilled and made by Jess Graber in Colorado, Graber has been completely up front in interviews that they source the whiskey from MGPI (formerly known as LDI), which is the source for what seems like half the bottles of bourbon and rye on the shelves these days. So while I applaud Graber for being honest when asked, I sure wish their bottle and website were honest, period. 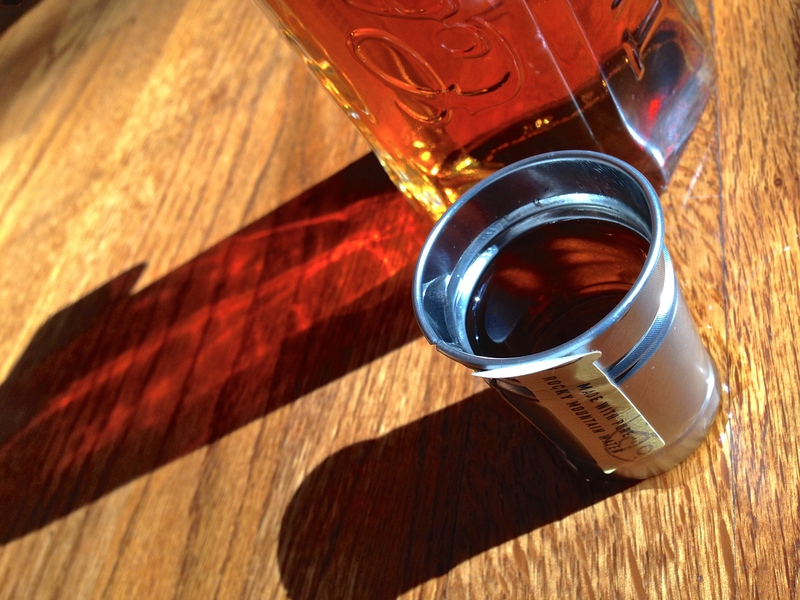 Oh, and the bottle comes topped with a nifty tin cup you can drink from. Wouldn’t you know… it leaks! Now, on to Clyde May’s. This is an unusual beast for sure. Alabama Style Whiskey. On the bottle, there’s a very clear “distilled in Kentucky” line on the side, and a “bottled by Conecuh Ridge Distillery, Auburndale, FL” as well. 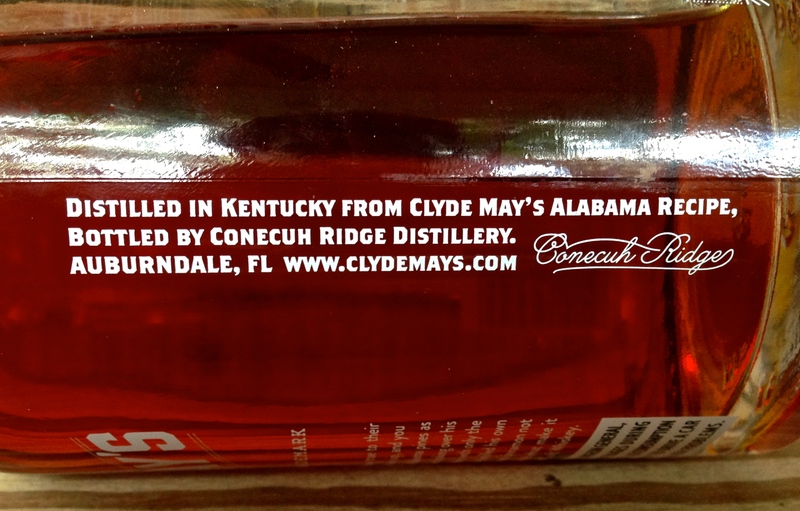 So we have an Alabama-inspired product, distilled in Kentucky, bottled in Florida. There’s a “since 1946” on the label, which is clearly a bit murky given that the whiskey has gone through many iterations of actual makeup, owner, and legality over the past many decades. There’s also a note that, “hints of green apple and cinnamon not only make it smoother than others – they’re what make it Alabama Style.” Which could lead you to believe that it just tastes like apples and cinnamon, or that they put actual apples and cinnamon in with the whiskey, or that they flavor the whiskey to give it hints of green apple and cinnamon. What do you think is the truth? The website helps a little, stating that “Clyde added oven-dried apples to his barrels. The resulting hints of green apple and cinnamon not only made it smoother than other whiskeys—they’re what made it Alabama Style. 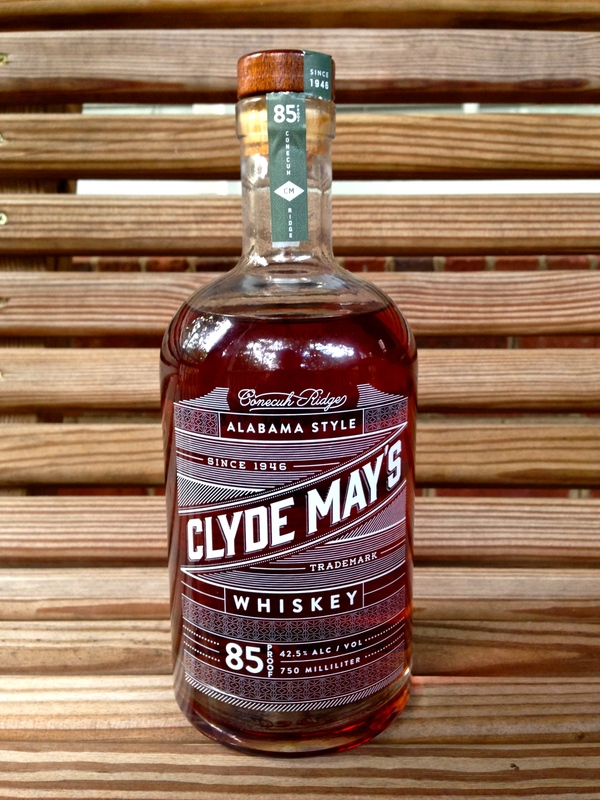 Today, we honor Clyde’s legacy with a blend of 5 & 6 year old bourbon, handcrafted in small batches and finished in that Alabama Style.” Based on that, I was thinking that maybe they use oven-dried apples today as Clyde May once did – but their representative tells me, when I ask, that it’s just flavoring. Smooth, nicely balanced with a good dose of rye in the mix. High rye fans out there will enjoy this for sure. Very nice sipping neat. Simply put, I dig the whiskey, but not the marketing. Maybe Jess Graber can get his folks to do something about the messaging on the bottle and on the website (and keep on bottling the good honest whiskey, but in a more honest way). You get green apple right off the bat on the nose, quite prominently. Sipping neat, though, this stings a bit for 85 proof and feels a bit off. I actually wouldn’t mind if the apple were more up front here (like it is on the nose). If you’re gonna do apple flavored whiskey, you may as well go big and DO APPLE FLAVORED WHISKEY! This should work just fine in cocktails or, heck, with some apple juice over ice. Combine apple cider, sliced orange and the spices of your choice (we suggest allspice, nutmeg and cinnamon) in a medium-sized pot. Gently simmer over medium-low heat for 10 minutes. Pour into mugs and add in Clyde May’s Whiskey. Stir well and serve warm. Full Disclosure: Tasting samples provided. George Dickel sent Thirsty South a video! I love, absolutely love your bottom photograph. Inspirational and brilliant! and your honest and slueth-ful writing is top notch too! I’m new to the whiskey, rye, bourbon arena. I stumbled upon your blog, lord knows how, but I’m glad I did. I get too caught up in the marketing mystique and I need an honest person to steer me clear of the bs and onto the good stuff. Thanks! Thanks, Denine, much appreciated. Enjoy seeking out the good stuff. I wonder how many bottles of rye and bourbon that are now on the shelf come from the same industrial distiller in Indiana? I think it is an American scandal. I can’t count that high. If only someone would do a story on how blasphemous Bulleit Bourbon is! Talk about marketing only and no real history! KBD only started distilling a couple years ago, so it’s not the distiller of Clyde May’s.